J.K. Rowling is the author of the record-breaking, multi-award-winning Harry Potter novels. Loved by fans around the world, the series has sold over 450 million copies, been translated into 79 languages, and made into 8 blockbuster films. She has written three companion volumes in aid of charity: Quidditch Through the Ages and Fantastic Beasts and Where to Find Them (in aid of Comic Relief), and The Tales of Beedle the Bard (in aid of Lumos), as well as a film script inspired by Fantastic Beasts and Where to Find Them. In 2012, J.K. Rowling's digital company Pottermore was launched, where fans can enjoy her new writing and immerse themselves deeper in the wizarding world. J.K. Rowling has written a novel for adult readers, The Casual Vacancy, and also writes crime novels under the pseudonym Robert Galbraith. As well as receiving an OBE for services to children's literature, she has received many awards and honours, including France's Legion d'honneur and the Hans Christian Andersen Award. Jim Kay won the Kate Greenaway Medal in 2012 for his illustrations in A Monster Calls by Patrick Ness. He studied illustration at the University of Westminster, and worked in the Library & Archives of Tate Britain and then as an assistant curator of botanical illustrations at the Royal Botanic Gardens at Kew before returning to producing art full-time. After a one-man exhibition at Richmond Gallery he was approached by a publisher and his freelance career began. Alongside his illustration work, Jim has produced concept work for film and television, and contributed to the group exhibition Memory Palace at the V&A museum in London. 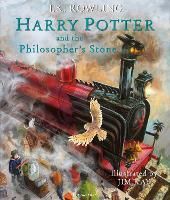 The Illustrated Edition of Harry Potter and the Philosopher's Stone was published to international acclaim. 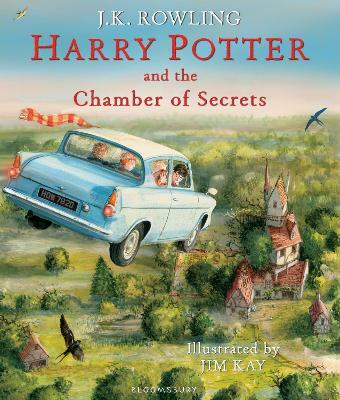 Bloomsbury has commissioned Jim to illustrate all seven books in J.K. Rowling's classic series. Jim lives and works in Northamptonshire with his partner.